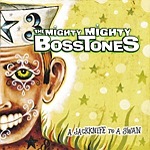 One of their strongest albums to date, The Mighty Mighty Bosstones' A Jackknife To A Swam follows up 2000's Pay Attention. This time around the band has landed on Los Angeles-indie SideOneDummy, opting out of the major label system to create the record they wanted to, with no outside pressures from anyone. And the result is an un-compromised melodic rock/punk/ska prize. Opening with the title track, The Bosstones prove they mean business, making you dance with a melodic, crunchy rocker walking the line between pop-punk and good, clean hook-laden modern rock. Horns blast in the background, fleshing out the melody, while front man Dicky Barrett's vocals cut with his trademark growl. "You Gotta Go" finds the band running through the ska-punk that helped them establish a worldwide fan base, with the emphasis on the punk. "Sugar Free" is the band at their best, writing crunchy, fast, sing-along melodic ditties that trade in the power and style of punk, but the production has more in common with modern rock, creating a hook-y sound that is undeniably addictive. The Bosstones may have long been written off as another ska-punk band, but they're so much more. They can do the ska-punk or the ska ("Win" and "Old School"), but they can also do punk rock and melodic rock, as noted above. They're versatile, fun, and with the horns fleshing everything out, they pack a mean punch. A Jackknife To A Swan is a record made by a band that hasn't given up. One that will still be there even when the major labels refuse to acknowledge ska as a musical form until the next wave hits the mainstream. I'll give this a B+.